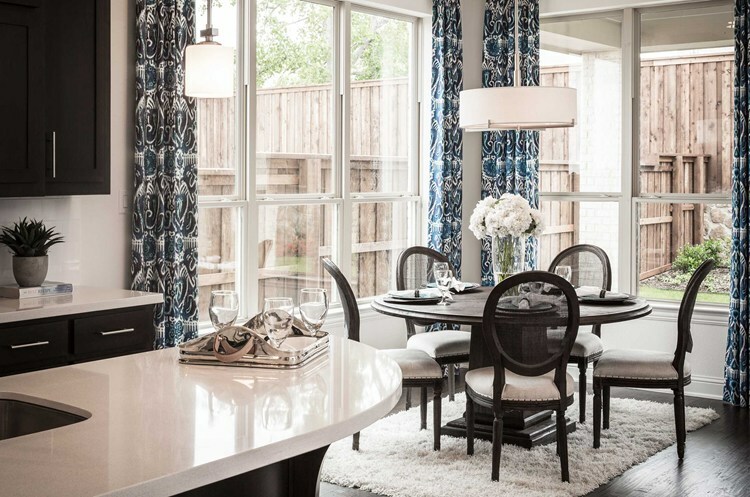 Tall, patterned curtains add a splash of color to a neutral kitchen area like this one from floor plan Plan 537 by Highland Homes in Austin, TX. Despite their ultimately simple function, the process for choosing windows treatments is incredibly complex. With decisions to be made about privacy, lighting, fabric, sizing and color, many homeowners are left scratching their head. The good news is that choosing window treatments isn’t nearly as hard as it seems. By breaking the process down into manageable, chronological steps, you’ll be well on your way to choosing a stylish window dressing. Let’s get started! Having an idea of a room’s purpose and needs is critical because it helps to narrow your search and define your choices. But more important, “if [a window treatment] doesn’t fit the function of the window, it won’t work,” says Sally Morse, director of Creative Services for Hunter Douglas, a leader in window coverings. Remember, the direction a window faces, the size of the room and even the shape will have significant implications on light flow, so be sure to account for any unusual corners and far-reaching or wide spaces. While color is important in selecting the right window treatments, Rush believes that fabric should be considered before color. “The amount of transparency in your fabric selection will dramatically alter the color once the sun begins to shine through,” she says. Ultimately, the fabric you choose should reflect the overall mood of the room it’s in. “For a sunnier vibe, consider a lightweight fabric like linen or cotton,” says Parrish. These fabrics can contribute to a casual, airy feel. On the other hand, if you’re looking to add drama, she recommends adding heavier fabrics such as suede and velvet. “Heavyweight fabrics block out light and offer a more formal touch to a space,” she says. When considering fabrics, don’t forget about lining. “Every time you add another layer at the window, it adds insulation,” says Morse. Not only good for temperature control, lining is what gives a fabric its fullness and volume, in addition to protecting it from UV rays. “The lining … protects the integrity of the print — it doesn’t let the sunlight wash it out,” Morse notes. The length and width of curtains can differ dramatically depending on the look you’re trying to achieve. For a gathered look, you’ll need curtains three times as wide as the window while a tailored look will require curtain panels to be a mere two inches wider than the window, says Parrish. In regards, to curtain length, there are three prevailing trends: hovering or brushing, breaking and puddling. The hovering or brushing style describes a curtain that sits just off the floor or window sill. A clean, sleek look, hovering curtains are popular today because of their easy maintenance and the fact that they don’t collect dust. The breaking style describes curtains that carry an inch or two over the floor so as to pucker at the spot where they meet the floor. Midway between hovering and puddling, breaking shares the easy maintenance of the former and elegance of the latter. The puddling style describes curtains that are excessively long and splay out across the floor like a train on a wedding dress. A very formal style, puddling was done a lot more in the past, says Rush. Puddling lends an elegant look to a room, but is notorious for collecting dust and could be a tripping hazard for young children. Choosing color is the notoriously fun part of every décor project and the one requiring the least amount of guidance. At the end of the day, your decision ultimately aligns with personal taste. However, if you’re looking for a professional’s take on the matter, Parrish suggests pulling a hue from the already-established color palette of the room to use in your windows treatments. You can make your curtains bolder by dialing up the saturated colors and busy patterns or you can scale back to a neutral for a more subtle look, she says. And don’t forget to examine the fabric in the specific room you’re considering as “colors can look dramatically different depending on the environment,” says Rush. Ashley Steel is a previous staff writer for HomLuv.com and NewHomeSource.com. She wrote about a variety of topics, from helping Realtors understand how to assist clients in choosing new home options to helping consumers find home design inspiration in a variety of places including a chic industrial-style bar to chicken coops.